What is a good moveset for Barbaracle? If you have a good moveset for Barbaracle, post an answer below and upvote the best ones. Remember, this is for competitive movesets, not in-game. Ability, EVs etc should be included. Make sure to read all the guidelines here. Barbaracle Pokedex & learnset for reference. I do not like it. Honestly. Shell Smash set. Cloyster > Barbaracle, but we are not going to see that thing in OU, where Venusaur will demolish it, nor in UU where Victini will care of it with Thunderbolt. I included a max of contact moves so that it get an advantage, and the focus sash provides it to endure a hit after Shell smash, allowing for an eventual sweep, by looking at the EV spread and nature. Razor Shell is your STAB and contact move, main one. Cross Chop, I would use it over Stone Edge for contact purposes. Dragon Claw = Dragon KOing. Enjoy ! Honestly, frankly, I prefer Carracosta over that thing, but I'm not saying it is not worthy of a try. Likely tier is probably going to be RU, and the reason for this I believe I elaborated in the metagame speculation thread. If not, then somebody else gave the reasons for me. In the RU tier, Dragon Claw is going to basically be useless. There is only one Dragon who sees any regular use in the tier (Druddigon) and one more might be added if my Dragalge predictions are correct. As such, I'd suggest replacing it with an assured Stone Edge, which is still a technical base 150 power attack (STAB is one of the reasons I would suggest Stone Edge over Cross Chop on the above set also, as Cross Chop is a technical 133 base power. In addition, Stone Edge gives better coverage than Cross Chop.) I'd then honestly go with Life Orb as the item, as Focus Sash is often too difficult to pull off. Again, I think this guy will be a pretty big threat in RU, as it is a Shell Smasher with enough Speed to outspeed base 105 Scarfers after a Shell Smash. Yup, right. Commandant Trachy said it all. So Stone Edge > Cross Chop. I would use X-scissor over Dragon Claw. This guy could work well so long as you get the grass types out of it's way. EgdeQuake combo with secondary STAB in Razor Shell with Poison Jab for coverage against any grass types and fairy types. Tough Claws is ultimate death to anything as Razor Shell and Poison Jab both get the 33% boost. Or if you choose to run Sniper, in which case you can run Cross Chop and this way you can smash through any set-up walls with three moves having incredible chance to crit. Stone Edge actually doesn't get the boost. Barbaracle is pretty easily one of the most dangerous Pokemon introduced in Gen VI, even though it is not used frequently. 152HP, 252 Attack, 104 Spe. This is my Barbaracle set. If you want to read why you should use it over Cloyster, read my argument in the two paragraphs below this one. Shell Smash is well you know Shell Smash; it doubles your Attack and Speed and is used for Sweeping, at the cost of Defense. The given EVs let you outspeed Base 130 after the Boost, with the rest in Attack and HP to make it easier to set up. It doesn't need a Focus Sash, and a Life orb will just make it die before it kills your opponent's team. Choice Scarf Users are a bit of concern; not so much Priority if you run White Herb. Razor Shell is Barbaricle's gold Standard Attacking move; it is accurate, boosted by Tough Claws, and its 50% Chance to make your Opponent's defense drop makes Barbaricle harder to counter, especially after a Shell Smash. Stone Edge is Barbaracle's Strongest STAB Rock Type move, but it's unfortunate that it is not boosted by Tough Claws. Cross Chop has great coverage with Stone Edge, and is boosted. Tough Claws Makes Aerial Ace viable at 80BP, which lets it hurt the Grass Types it despises harder than Stone Edge and Fighting Types that resist it's STAB such as Keldeo and Toxicroak, as well as Chesnaught and Breloom. Earthquake can be used for better accuracy over Cross Chop, but Cross Chop OHKO's Ferrothorn. Barbaracle has a very wide movepool, so pick anything that you think you might need. When it comes to Shell Smashing, Cloyster is usually the first to come to mind. Barbaracle however, is by no means inferior, and is actually in many ways superior. Barbaracle's main disadvantage over Cloyster is that it lacks STAB Skill Link Icicle Spear, which does ~15% more Damage than Barbaracle's 100BP Razor Shell (Factoring Tough Claws), and lets Cloyster easily get past most Grass Types. But Barbaracle's most notable strength lies in it's coverage; it has practically anything for everything should it choose to run them, most of which that would otherwise be overlooked is made viable due to it's ability, Tough Claws. What can and can't stop Cloyster is definite; it doesn't have anything worthy of note to surprise it's opponents, and can always be dealt with by a single prepared team. When facing Barbaricle, you cannot be sure what will and won't be able to stop it; An Individual Team will never be able to stop every Barbaricle that comes their way, and that's what gives Barbaricle power. Furthermore, more directly speaking Stone Edge easily outdamages Rock Blast, and Cross Chop and Razor Shell outdamage Cloyster's Razor Shell. In other words, Icicle Spear is effectively the one and only thing Cloyster has offensively over Barbaracle. Defensively, however, Barbaracle is the easier of the two to set up, and that's another thing to consider! Barbaracle has lower Defense, but just like Cloyster it is not going to drop to a Physical Attack easily. On the special side, however, Barbaracle has substantially more Sp. Defense than Cloyster. To get an idea, practically any Special Attack that Barbaracle is weak to will OHKO Cloyster even if hit neutrally. Barbaracle's Special Defense isn't even relatively bad, because of this, it isn't restricted to setting up on Physical Attackers without a Focus Sash; Yet another good reason to use Barbaracle. On top of not needing a Focus Sash, it can therefore run a different item, such as a boosting item to bridge the gap between that 15% difference of Razor Shell/Stone Edge over Icicle Spear. Life Orb is not recommended though. In terms of Defensive Typing, as I said earlier, it's Special Weaknesses are not a comparatively weak point because Cloyster will drop to the same attack when trying to setup. Barbaracle's Rock Typing, however, gives it a few more resistances to work with, most notably Fire and Flying. This means it can setup a Shell Smash on Talonflame, a very common Pokemon (Barbaracle can actually just barely do it without investment, let alone Cloyster) It's weakness to Earthquake hurts, but Cloyster is Weak to Rock, which is more readily influential. Finally, Barbaracle is easier to fit on weather teams; in rain, it has outright more offensive power, and in Sandstorm, it is immune to the residual Damage and gets a Sp. Defense boost, making it an obvious choice. Cross Chop STAB contact move. Razor Shell STAB contact move and also may lower defense. Earthquake or Stone Edge because their powerful moves since its ability is Tough Claws and since it uses bulk up if you picked Bulk Up. Cross Chop isn't STAB, Stone Edge is. I would opt for Poison Jab rather than Shadow Claw because of the grass weakness and 30% poison chance. This 5 headed guy is a good sweeper, but it's gonna be OHKOED in OU. Breloom, Celebi, Ferrothorn And Venusaur. Abomasnow, Roserade, Shaymin And Virizion. Amoonguss, Ferroseed, Lilligant, Rotom-Mow, Sceptile, Tangrowth and Whimsicott. Overall, this guy is good. But it should have some support. The choice between X-scissor and Poison jab is tough for a lot of reasons. Edge-quake is resisted by only a few Pokemon (disregarding levitating steel or ground types, which can easily be countered by one or more of your teammates). Breloom, Chesnaught, Virizion, and Torterra all naturally resist Edge-Quake. The first three are weak to poison, but neutral to bug, and the last of the four is neutral to poison. Chesnaught easily takes a +2 X-scissor at 50% health loss per XS, but cannot stomach a poison jab with prior damage from spikes or stealth rock. Breloom, Torterra, and Virizion are ohko'd by either coverage move. Levitating Pokemon that resist Edge-Quake: Flygon, Lunatone, Solrock, Claydol, and Bronzong. Flygon is neutral to bug, but resists poison and has only a 6.3% chance of being OHKO'd by SE after stealth rock, but it cannot switch in on an X-scissor without getting OHKO'd, regardless of an entry hazard. Solrock, Lunatone, and Claydol are all weak to XS and will get OHKO'd. Sassy Bronzong is immune to poison, but takes neutral damage from XS and loses half of its health from SE, so it isn't a safe switch unless it switches in on earthquake. Physically defensive Bronzong still cannot take 2 XS, but is no longer 2hko'd by Edge-XS. Given that, a fully defensive set will not be able to do much against you and can easily be revenge-killed via pursuit (now neutral against steel, making it supereffective and a guaranteed kill). That said, gravity support would work wonders for the barnacle in dealing with these potential counters. Shell Smash: Smash dat shell and get back your defense with white herb! Poison Jab: Massive damage with tough claws and shell smash boost + grass types = fainted. Razor Shell: STAB, great power with shell smash and tough claws. Brick Break: Great power and with tough claws it can take out steel types. Do you mean aerial ace instead of air slash? Sniper and Scope Lens have always been a great combo, but are even greater with moves that already have high critical hit ratios. This set might not seem deadly at first, until you see what's happening. Shell Smash doubles Barbaracle's Attack and Speed stats, and therefore gets 678 Attack to work with(With Adamant) The next objective is to Substitute Down until your Lansat Berry Activates. What does Lansat Berry do? At 25% HP, the item boosts your Critical Hit Ratio by two stages, and is effectively a Focus Energy in the form of an item. Backed up by Moves with a high critical-hit ratio, this increases Barbaracle's chance to score a critical to a pristine 100% With Sniper, Critical hits do 225% their usual damage, so now, let's do the math: 339 Attack, x2, x2.25,=1,525 Attack. What do you think happens next? Stone Edge hits like a Nuke. Virtually everything that takes Neutral Damage from it is going to get OHKOed, and that includes even the most physically Defensive Pokemon in the entire game, with the main exception being Shell Armor Mega Slowbro (even then, Barbaracle would have a good chance of OHKOing it after Stealth Rock if it didn't have this ability) However, with all that power, we wouldn't want your sweep to be cut short because you missed your Stone Edge, now wouldn't we? That's where Shadow Claw comes in. 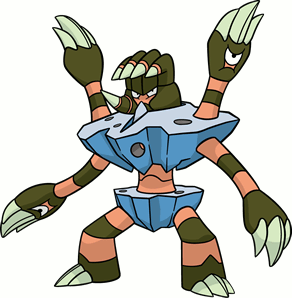 It might look weak at first, but even without STAB, it's so strong, it can OHKO Pokemon as bulky as having 100/100 defenses and is in fact stronger than the STAB moves of regular Tough Claws Barbaracle, which isn't weak in any stretch of the word. What makes this even more dangerous is that Ghost has extremely good Neutral Coverage, being only Resisted by Dark and Immune by Normal. Most Pokemon resistant to Ghost aren't exactly ready to take Stone Edge either, and a Resisted Stone Edge is still stronger than a neutral Shadow Claw. You can still switch up your moves to keep things interesting; Cross Chop pairs well with either Stone Edge or Shadow Claw, while Razor Shell is a STAB move, but keep in mind it only has 50% Chance to score a critical hit and is weaker than Shadow Claw otherwise. aerial ace: advantage against fighting/grass type&can never miss! stone edge: 100 power!& increases the critical hit ratio! Can barbaracle be good in competitive battling? Why is Barbaracle in PU? Why is Bararacle in PU? Gender lock in Friend Safari? What is a good moveset for Volcanion? What is a good LC moveset for Inkay?